"At 7:08 PM the New York Mets have won he National Leagues Eastern Division." 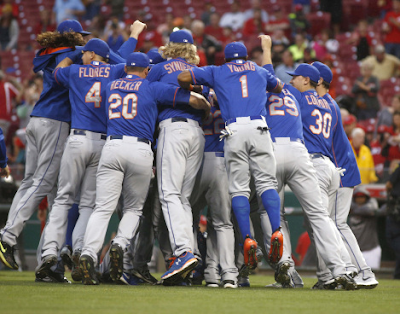 Us New York Mets fans deserved this more than anyone did. It had been nine long years since Carlos Beltran didn't swing at strike three ending the 2006 NLCS with the Mets losing in Game #7. Then the collapses of 2007 & 2008. I was at Shea Stadium on the last day of the old ballpark & witnessed the Mets blow a chance at advancing to that post season. Then the move to beautiful Citi Field but the bad Jerry Manuel seasons followed. 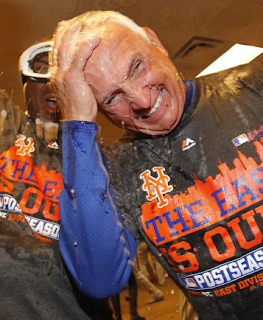 Then a few more disappointing seasons under Terry Collins made it even worse. But then the new age began, a few good draft picks, a few good trades & the development of these fine young pitchers. Add a few veterans in the mix & 2015 looked bright, although many were still skeptical. The Mets pitching led the way most of the early part of the year, as the team had problems scoring runs. But these Mets kept hanging in there. Then came July, the Mets brought up Michael Conforto who was tearing up the minor leagues, he solidified the left field position almost immediately. Earlier in the year they brought up Noah Syndergaard & later in the year Steven Matz. It was like the Mets were pulling rabbits out of a hat! The trade deadline first brought veterans Kelly Johnson & Juan Uribe who helped the infield troubles & gave the bench more depth. Then they added Tyler Clippard to the bullpen & was quickly the 8th inning guy. They later added Addison Reed as well. And of course there was the best trade they never made, not acquiring Carlos Gomez. That night Wilmer Flores shed tears on the field thinking he was getting traded. It didn't happen & Wilmer showed everyone how much he wanted to be a part of what was happening with the Mets. Then GM Sandy Aldeson landed the big one, he added one the games best all around players as well; Yoenis Cespedes who had one of the best August any Mets ever had. 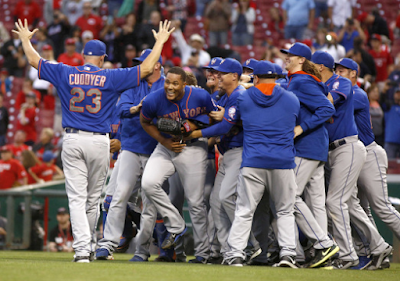 The Mets then put it all together, they were confident, they played as a team, everyone, everyone, pitched in. 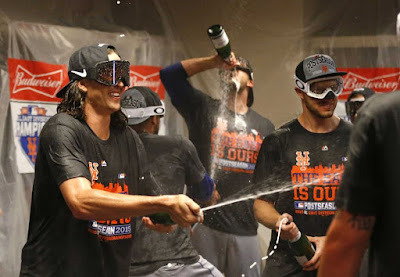 The Mets won 33 of 50 games after August 1st, they swept their one time NL East rival Washington Nationals twice, showing they were for real. They all but eliminated the Nats weeks ago but the numbers had to wait until tonight where the Nats were mathematically eliminated. 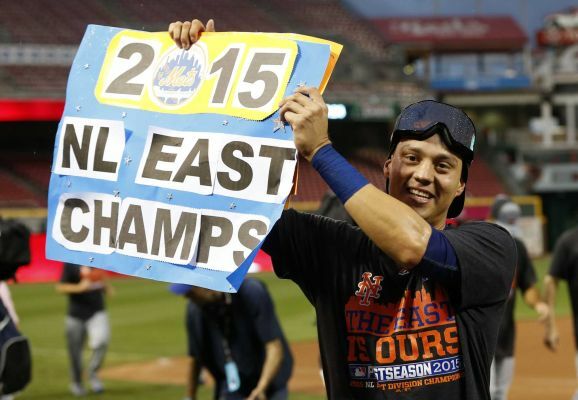 The Mets are now the 2015 NL Eastern Champions. It is the sixth NL Eastern Title for the Mets in the clubs history. September 26th 2015: Terry Collins first place New York Mets (87-67) had the Champagne ready in the visiting clubhouse of the Great American Ballpark, as the Mets took on the Reds needing just one more win to clinch the NL East title. 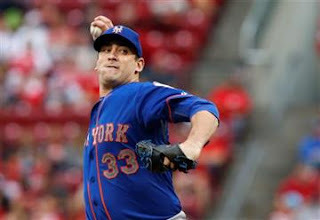 Matt Harvey (12-7) took the mound for the Mets, with 176 innings for the season under his belt, just shy of the controversial 180 inning limit upon him. It was Harvey's first start since tossing five shut out innings against the AL New York team last week. An unhappy Manager had to remove him due to the decision & controversy surrounding that innings limit. But today Harvey exceeded the short inning expectations by throwing 6.2 innings of baseball, he allowed two runs on nine hits, struck out six & walked no one. He easily earned his 13th win of the season on a day he later called "the best day of his career". 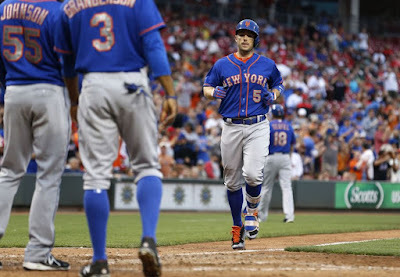 The Mets offense made it easy right off the bat, literally. In the top of the 1st, walks to David Wright & Travis d'Arnaud plus a base hit by Daniel Murphy loaded the bases for the Mets latest hot hitter; Lucas Duda. Duda hit his third HR in less than 24 HRs as he blasted his first career grand slam to right field, putting the NL East Champs up 4-0. 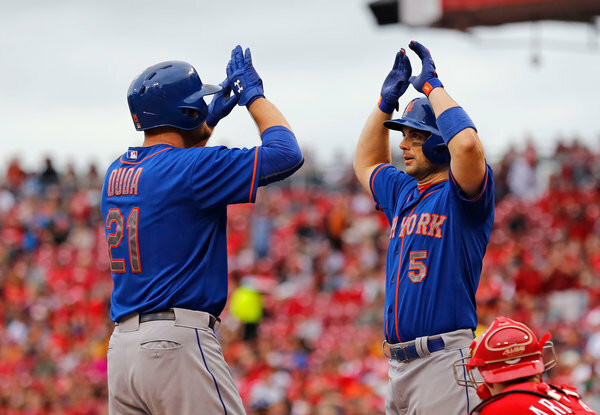 It was Duda's 25th HR of the year & he now has 70 RBIs, both team leading numbers, with the exception of Yoenis Cespedes. 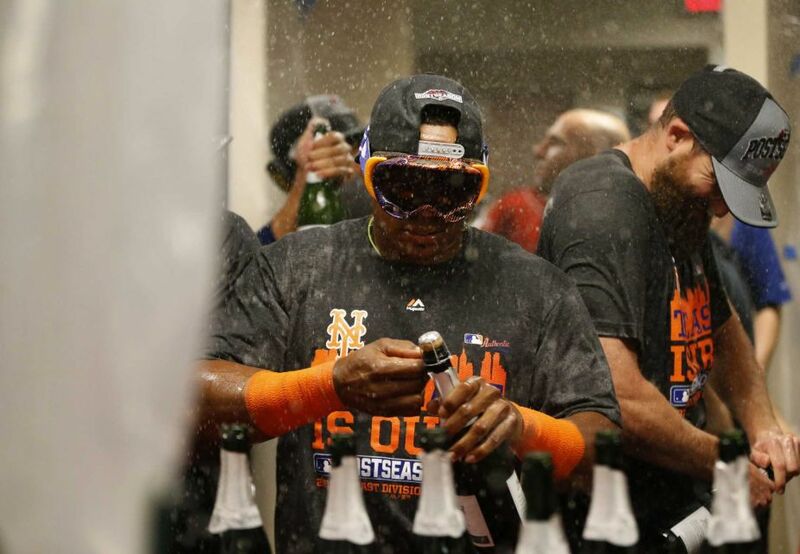 (Cespedes did not arrive in New York until August 1st so most of his stats were from when he was in the AL). In the 2nd, Curtis Granderson who put together a fine season in the lead off spot, added a solo HR matching Duda with 25 on the season. In the 3rd, a Michael Cuddyer two run double scored Daniel Murphy & Lucas Duda to make it 7-0 Mets. In the visiting 9th, Kelly Johnson & Granderson both singled. Captain David Wright topped off the afternoon with a three run HR sealing the 10-2 Mets win & sealing the NL Eastern Championship. The Mets celebrated in the clubhouse & later poured onto the field then acknowledged the Mets fans in the stands in Cincinnati. It was quite a day, with a Happy recap!! 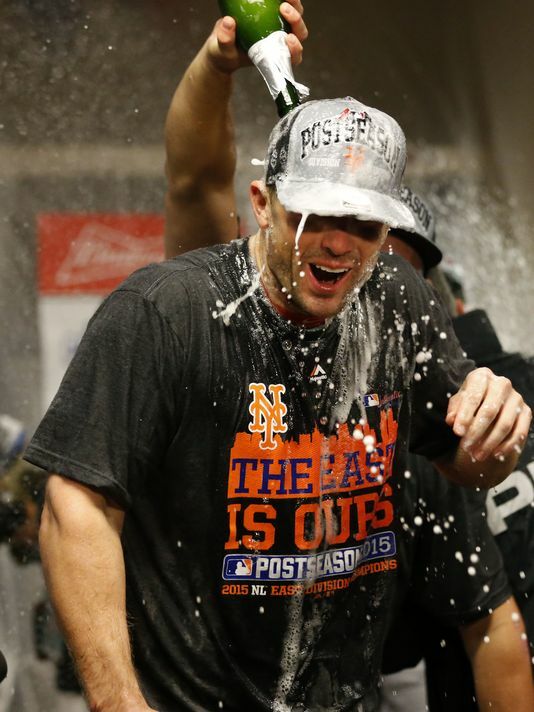 Quotes: David Wright- "I can't be more excited or more proud to wear the orange and blue, I bleed orange and blue. To be able to celebrate with these fans, this city, this team, is a privilege. You just can't help but smile. For the last few months, I've tried to enjoy this as much as possible, soak this in. This is a surreal feeling." For Mets Manager Terry Collins, he's headed to the post season for the first time: "It's worth all the time, all the effort, all the things you do — this is the culmination of it all. We're going to have a little fun tonight and relax tomorrow. Right now we have to go get home field advantage, that's next." "Certainly when we went out and got Juan and Kelly, the attitude in here changed. All of a sudden guys said: 'You know what? The organization went out and did something because they think we're going to win this.' 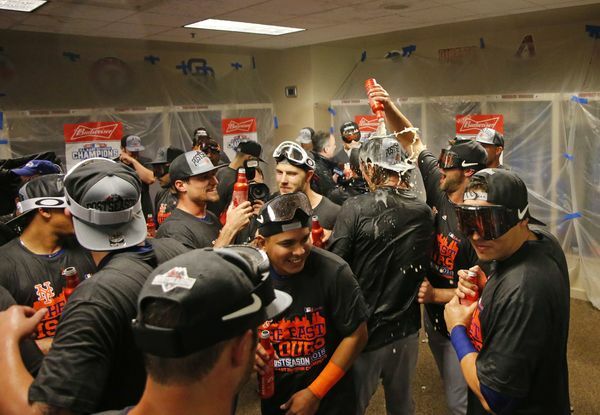 And I think it changed the entire outlook in the clubhouse." GM Sandy Alderson: "It's gratifying to see it come together. You never quite know when it's going to happen. But you have to have faith in your approach and what you're trying to do, and confidence that it will eventually work out. And all you can do is sort of enhance the probabilities." 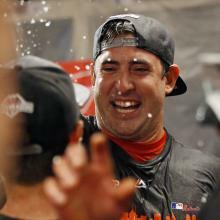 Matt Harvey: "For all the stuff that people have said, the last thing I ever want to do is put the ball down. We're on our way to October. I'm going to be out there and I'm going to be fighting every time I get the ball." Even the Nationals Bryce Harper had something classy to say: "They did a great job this year and they're doing it. Coming from the East, I hope they win it all." 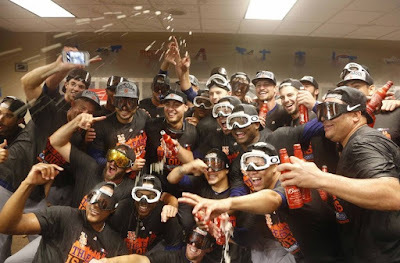 This one is for us the life long fans, the broadcasters especially Gary, Howie, Keith & Ronnie, the players who have been here a while Daniel Murphy, Jonathon Neise & Captain David Wright!! Way to go guys & Thanks!